If you are a fashionable person, you should install this eye-catching sinks from Lagares. Corian sinks offer beauty and versatility, made from acrylics with natural materials, flat surfaces of corian sinks are ultra hygienic. With minimalist and linear water outlets do not require plugs. The transparent front panel adds clarity to the design. 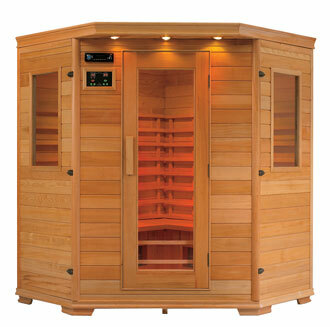 Let’s enhance your lifestyle with infrared sauna, this handmade sauna is included with five ceramic sauna heaters and safe form of heat energy that is known by infrared ray. This healthy rays will help you release toxins from your body, plus comfortable ergonomic backrest, cd player, 2 speakers, reading light and drink stand. The most important thing is, the digital control box to control over the temperature as you wish. Look at this beautiful automatic bathtub from Stas-Doyer, enjoy the hydromassage on your daily routine with Dulce bathtub. Available in 130 model and 6 massage functions, 180 jets of water, with size for one person, you can program this bathtub that suit your needs. To add futuristic appeal, Dulce bathtub is combined with vivid chromotherapy lighting. You can have unique experience with shower head from Zucchetti, it’s like taking a shower under the rain with adjustable flow. This luxury shower head is designed by Ludovica and Roberto Palomba. The ceiling-mounted shower panel features a simple circular light which incorporates the benefits of color therapy while the speaker on the side plays relaxing tunes or your favorite soundtracks. The attractive head can be installed flat on the ceiling or suspended with cables, and is available in a chrome or satin finish. Whether you prefer the standard version or the version with central LED light. 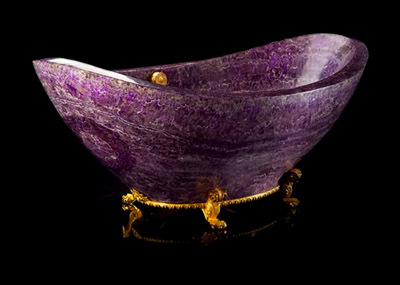 This luxurious bathtubs and sinks are built entirely out of amethyst, a semi-precious stone. The combination of golden accent and natural color of this beautiful stone makes a perfect choice for you who are looking for luxurious decorative bathroom. Just for your information, this stone in the past regarded as one of the most precious gemstone along with diamond, sapphire, ruby and emerald. Bathtub doesn’t always in white color, if you are bored with the white plain color, now you can pick Kali’ Kolor tubs from Blu Bleu which has 192 of color choices that suit your personality. Choosing glossy, satin or metallic will ensure that you have a rare bathtub and very fashionable. The tub comes with removable panels and four different shapes. With one touch of a button in the digital remote control, you have option as air jets, ozone plant, and chrome relax lighting. Want to have open space impression ? The new Andros shower cabin range from Glass Idromassaggio will help achieve that. Enclosed by 8mm thick toughened glass, each shower cabin is designed to be unobtrusive, blending into your bathroom decor rather than dominating it. The cabin glass stays sparkling clear due to the special Shining Glass scale-preventative treatment it receives. A functional anodized aluminium structure grabs attention as the ultra-modern centralised control panel – and home to the many exciting shower functions. The Raindance shower head slides to reach where you need it most; the 8 side jets provide hydro-massage; a steam bath function comes as an optional extra.